The world was informed the Osama bin Laden was killed on Sunday evening. Now that the story of his life has come to a close, we're taking a moment to look back how Osama influenced the world of video games. As you might've guessed, he mostly got shot and killed. Well, actually that's all he did. Here are a few prime examples. 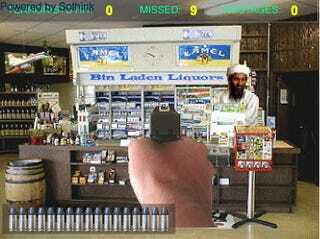 Bin Laden Liquors (2001) - Shoot bin Laden in a liquor store while saving naked hostages. Fugitive Hunter: War on Terror (2003) - This sub-par PS2 shooter gained a little notoriety by making bin Laden its final boss. Each level ends with a fighter-style "capture" sequence, which is what you're looking at here. Kill Osama bin Laden: The Game (????) - It doesn't get more basic than this. Click to shoot Osama's noggin at various locales. Postal 2 (2004) - The Postal series and Osama bin Laden have a larger than normal relationship. In Postal 2, every male terrorist enemy is designed in his image. Postal 3 (To be released - 2011) In the upcoming Postal sequel, bin Laden is hiding out in the town of Catharsis, where he is running a restaurant called "Talibannigans." Spec Ops: War on Terrorism (2001) - Pummel a seemingly pacifist Osama into a bloody pulp. Unreal Tournament (Custom Skin) (2001) - In the wake of 9/11, this Osama skin was a means of getting out pent up anger towards the elusive terrorist. Kuma\War (May 7th, 2011) - Kuma Games announced that the next episode of their serialized shooter will tell story of Osama's demise. Falling Fred (Mod) (2011) - Normally in the game Falling Fred, you try to help Fred avoid objects while he perpetually falls, however developer Dedalord Games released an update of their game today, turning Fred into "Ogama Ben Ladder," allowing you to smash your bin Laden look-alike instead of saving him. Mujahedin (2011) - A Newgrounds flash game where players take on the role of a suicide bomber attacking a US army base. If you're successful, Osama says that you can be friends and get a drink together.